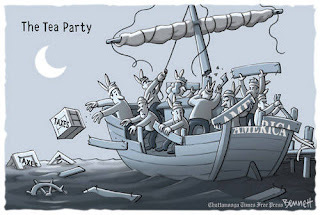 ~ The cartoon is labeled The Tea Party, but it might just as easily be those who call themselves conservatives hacking the boat to bits in protest. There is a difference between a surgeon's scalpel and a sociopathic slasher. One excises that which threatens health, the other acts in bloodlust wielding the implement in hand without regard to the screams of the victim. 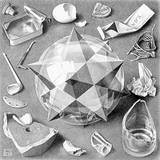 It has become all-too-fashionable to "debate" the merits of Keynesian economic policy and to question the role of government as spender of last resort in priming the economic pump. I remain astonished at the cavalier facility and brazen disregard of history with which ideological partisans, abetted by a stenographic media, employ the tactics of the Big Lie on economic policy. The lessons of the last gilded age, the Great Depression, FDR, and how the fragile recovery then was completely halted by a harsh set of austerity measures are completely dismissed as if they had never occurred. We are told we must act immediately and drastically to reduce government debt, the same argument made in the mid-1930's. It will have the same sorry result. The economy appears to be showing some small signs of renewed vigor. For once I am relieved that our Congress is so utterly dysfunctional that they probably cannot enact any economic policy at least until after the election. Perhaps there can be a modest recovery if we just leave things alone. First do no harm. It sure looks as if history is repeating, but all we hear are the Chicago/Austria/supply-side clods who ought to have been laughed out of town by now. There are still people alive today who lived hand-to-mouth through the Great Depression. They were there. Why are their voices not now being heard?